We are currently open by appointments, call a day ahead. Be sure to check back the first week of August for workshops, U-pick avaliblity , or to schedule your individual wellness center visit. FRESH BUNDLES are now avalible online and will be shipped directly to you, along with any of our lavender products. Fully mature Bagged in Burlap lavender plants from our fields. Each plant is available for $45.00 each, purchase 3 or more at $40 each. All plants $45 during the festival. BABY LAVENDER PLANTS - We are so sorry, but we are CURRENTLY SOLD OUT of all starter plants. Full bloom season is between late May and late June, with the blooms and U-pick availability again in the fall. Visits can be scheduled for group craft workshops, lavender lunches and informative tours and be sure to check our Wellness Services information for a full list of unique experiences you can add to your visit. Of course, be sure to remember to plan your Summer Solstice weekend with us at our 10th Annual Lavender Festival, June 16-17. Peaceful Acres Lavender Farm Market Boutique is open with a full variety of our farms handcrafted products made here on the farm. We will be stocking some fine local handmade gifts for women, not just gifts for her as we'll be stocking some of our favourite imports from Guatamala and Indonesia. Both uniquely handmade by the people and sold by native friends of these countries at events here and throughout Ohio. The variety to choose from will be complimentary to everyone's taste. Peaceful Acres was created on a vision to create a centre of healing, a place of relaxation and escape, and a place of community. We are passionate about bringing the body, mind and soul in line through holistic care, and connecting to nature. Peaceful Acres Lavender Farm wellness center is OPEN! Certified Reflexologist, Kym Prell will be taking appointmentswith clients daily. Schedule, relax and be pampered with your feet up laying in a comfortable recliner. Enjoy your reflexology with much more than just a foot massage in a peaceful environment. Experience many of Peaceful Acres unique attractions. Visitors can schedule a private farm tour year round. Four times a year we offer full farm tours talking about one of Ohio's Earthship homes. During this tour you will learn more about what is reuired to build an earthship. Topics include building department processes, EPA regulations and if there's a will there is a way, anyone can build. Sorry, no interior tours of our home are avalible at this time. Not interested in green construction? Peaceful Acres specializes with groups visiting for a lavender tour. These farm tours are popular amongst lavender lovers. During the lavender field tour you have an option to U-pick lavender, try lunch by Jen's Uptown Deli. Lunches come with a yummy croissant lavender lunch chicken salad sandwich, lavender lemonade or lavender iced tea and a lavender scone for desert. The farm accommodates educational tours for school groups, designers, garden clubs, and other large groups. Tours are specialized towards Alternative Building method conversation and green construction. 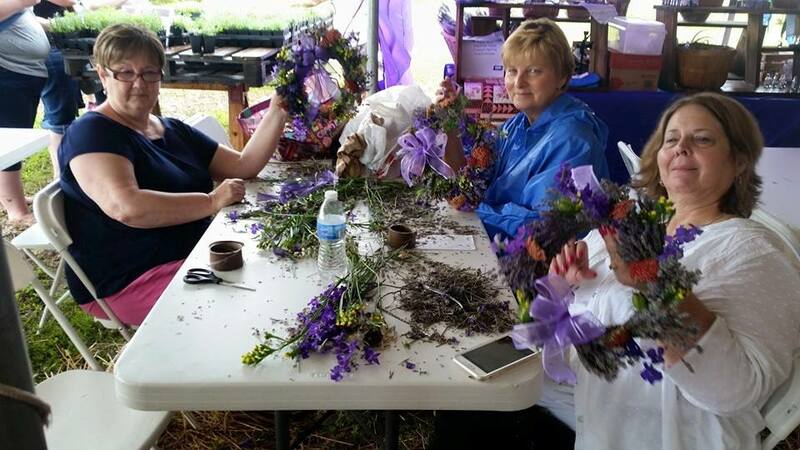 Experience the making fo your own lavender wreath or dream catcher to take home. Wreaths are made into a 10" willow tree base ready for attaching lavender and many other flowers. Includes - ALL materials and tools are provided during the workshop. Workshops good for any size group. WE'RE NOW OPEN by appointment, call a day ahead.